“Pay Dirt” is the only 38’ Blackfin Combi Express of its kind on the market! She is super clean and has been extremely well maintained both mechanically and cosmetically by a full time captain and an owner with an open checkbook mentality. “Pay Dirt” is a proven tournament winner and fish catching machine. The boat was extensively refitted in 2014 with New Cummins QSC 8.3 600 HP Engines, Twin Disc Gears, New Hardtop, Custom Spray Rails, and Non-skid throughout. With all of her upgrades, enhanced Fuel Capacity of 715 Gallons, and a 27 Knot Cruise speed with a super-efficient 45 GPH fuel burn, she truly is a one of a kind boat!!! Don’t miss your opportunity to own an immaculate, turn-key, mid-size express for under $300K!!! fuel capacity: 715 G. 2706 L.
Boat is very clean and extremely well maintained both cosmetically and mechanically. There is no other express on the market in this size range that offers such a great value for the money. Because we have one simple philosophy: Always take care of our customers, and one company-wide mission statement: Consistently exceed our customers' expectations. It’s a philosophy and mission that has been the core of who we are since the start of our company in 1970. Today, nearly 50 years, twelve locations, and three generations later, we have not wavered from our core and ethics. 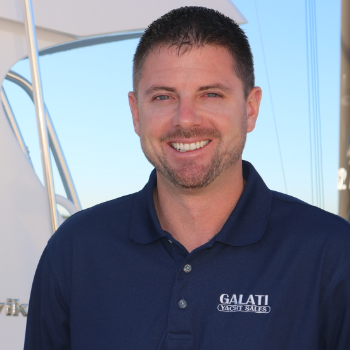 Each and every team member at Galati Yacht Sales is there for you every step of the way...before, during, and after the sale, to assure your time on the water in this 38 Express is filled with great memories.